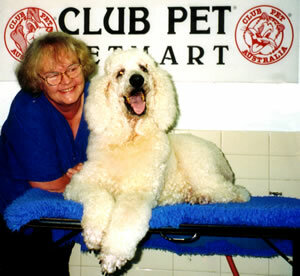 Lorraine Smith is a highly regarded groomer based in Clayton. Lorraine is the proud owner of pampered, 12-year-old standard poodle, Emma, the celebrity pooch better known as Eponnee-Rae in the ABC hit series Kath & Kim. Eponnee-Rae is the new addition to the marital home of Kath & Kel in the fictional suburb of Fountain Lakes. On location at Patterson Lakes where the hit series is filmed, Emma received star attention and even had her own grooming table. To have your pooch pampered by Lorraine, email Club Pet today.